It was a Saturday, and that means busy. If you’re the kind of person who likes to visit National Parks (or would like to become the kind of person who likes National Parks) let me give you a bit of advice from an insider: never go to a National Park on a weekend. Just don’t. I don’t care how tough it is to get a Tuesday or Thursday off; if you can’t come on a weekday you should probably just forget the whole. Especially if the weather is going to be nice. Today’s forecast was sunny, which meant that from 9:30 onward the line of cars would be stretched out of sight. Normally in my line of work we take time with each individual visitor, answer their questions, give them useful information, and laugh politely at their terrible jokes. On a sunny Saturday, however, we have one priority: get these people through as quickly as possible. Rush them through. Work efficiently so that no movement is wasted. Know the buttons on the register so well that you can ring people up without having to think. Sure some people might feel slighted but trust me; they’d feel worse if they had to wait in line for a half hour. It was about 3:30 PM when it happened. Traffic had peaked at noon but cars were still piling up. If I didn’t keep an eye on maintaining traffic flow I could end up with a massive line to plow through. Still I was keeping thing moving nicely until a very small and sweet old lady pulled up the window. She was wearing a wide brimmed straw hat to block off the sun and was appeared to be ready for a wonderful time in the park. She opened her purse and removed her Senior Interagency Lifetime Pass. I was glad. The Senior Pass gets you in free of charge, so all I had to do was hand her a map and she’d be on her way. “Would you like a map?” I asked for the 147th time that day (while somehow still maintaining a chipper tone and broad smile). She nodded again. I glanced out the window and saw that the line was beginning to lengthen behind her, and more were coming to join them. “Are there any signs for the reflection lakes?” She was oblivious to the growing line. “Yes, there are several signs, you can’t miss them.” Surely she would leave after that. I gave her my biggest smile. She smiled, thanked me, and went on her merry way. I sighed and got ready for the next visitor. It was a husky man in his thirties with a black goatee and gelled hair. This was going to be a long afternoon. Here it is! Without further ado, may I present the conclusion to the story of the Giant Who Had No Heart. Askeladen told the wolf all about the past three days at the giant’s castle, and what he had learned there. Sadly the wolf did not know where the lake was, for the woods contained many lakes, and many of them had islands. There was nothing for it but to search. The wolf could move as fast as the wind but the woods were wide and deep. They spent many days searching it. They came to dozens of lakes, some large, some small, some clear and clean, some stagnant and muddy, and when the lake had an island they would swim to it and search; but there was no sign of any church or well. As the days passed it became difficult to find food and the wolf began to slow and weaken. Askeladen was hungry as well and began to despair in spirit; every day that passed made it seem all the more likely that their strength would give out and they would die in the woods, never to save the princess or his brothers. Perhaps that is what would have happened, but on the ninth day of searching they came to a lake the wolf had never seen before. Its waters were still and its surface was like brilliant silver. In the morning mists Askeladen could just make out the shadow of an island far out in the cold and deep waters. The wolf plunged in with Askeladen clinging to his back as he slowly swam to the island’s shore. As they swam the fog thickened until all around them was solid grey and white. The only sound was the wolf’s paws paddling through the water. It was an eerie crossing, and Askeladen’s heart began to beat quickly. He felt that this lake was different from the others. It was only a few moments later when they reached the island’s pebbly beach that he saw that he was right. Rising out of the mist was a stone steeple which sat over a stone archway whose wooden doors stood cold and black in the white fog. It was a small stone church that had been abandoned many decades ago. Many bricks had fallen from the walls, and the whole building was crawling with moss and ivy. Askeladen went up to the archway, but he found that the thick oak doors had grown as hard as iron with age, and were locked tightly shut. He slowly made his way around the outside of the church, looking for a hole or a gap in the walls that he could slip through; but there was none. He came back to the door and was still puzzling over how he would get inside the building when he saw a gleam of silver light coming from the top of the ruined steeple. Askeladen soon explained the problem and as quick as wink the raven flew to the steeple’s top and retrieved the silver key. Askeladen tried the key in the door’s lock and with the sound of a click the doors swung open, revealing a dim and ruined sanctuary within. With another bow the raven said “Farewell! I wish you luck on your quest.” Then the raven flew away to parts unknown. Askeladen and the wolf carefully made their way into the church. The only light came from holes in ceiling and the air smelled musty with mildew. There were several rows of wooden pews that had fallen to pieces and rotted over the years. Hanging from the walls were torn and moldy tapestries, black with age. It was an unfriendly place. At the far end of the room, near the southern wall, was a small stone well that sunk through the church’s stone floor. Askeladen hurried to it and looked down its shaft. The water was cloudy and dark, but its surface was only a few feet down. Sure enough, a duck was swimming peacefully atop the water. Askeladen immediately called out to the duck, talking softly to it, doing his best to coax it out of the well. He searched his pockets for old breadcrumbs and offered them with an outstretched hand. Eventually the duck gave in, and with a great flap of its wings flew to the wells edge; but wouldn’t you know it as soon as the duck landed it laid its egg, which fell and sunk to the very bottom of the well. Meanwhile, not too many miles away in another part of the forest, the giant was walking through the woods as he did every day. Today he was very annoyed, for there were less and less things to eat or turn to stone, and he never did find the magpie who had dropped bones down his chimney. Suddenly, as the egg that held his heart fell into the cold water of the well miles and miles away, he knew that something was very wrong. “Ug!” He yelled in a voice like an earthquake. “Something feels very off.” The giant began to feel a bit afraid. He did not fear swords or spears or arrows for they could not harm him as long as his heart was locked safely away; but if someone ever found his heart he’d be in a lot of trouble indeed. Stroking his chin, he began to run toward the island as fast as his long legs could take him. Askeladen held the egg carefully in his hands. Though it had been sitting in ice cold water the egg itself was warm to the touch. He took it outside into the morning light and studied it carefully. It gently and slowly throbbed in his hand, and when Askeladen put it to his ear he could hear a thudding heartbeat. Suddenly the air rang out with the sharp crack of breaking tree limbs. On the far side of the lake the giant appeared, his eyes peering from place to place. When he spotted Askeladen he howled with anger; but when he saw the egg in his hands he shuddered with fear. The giant leaped into the lake and ran with incredible speed toward the island. I would be lying if I said that Askeladen was not tempted by the giant’s words. But he only considered them for a moment. No good comes from giant wishes, if they are even granted at all (for giants are notorious liars when their lives are in danger). Instead he took the egg and squeezed it again, with all his might. The giant shouted, and raised his hand to crush Askeladen to the ground; but it was too late. Askeladen had squeezed the egg until it burst, and the giant breathed his last. His body sunk into the water, never to be seen again. Soon after the waters of that lake became strangely black and stagnant. To this day all animals of the forest avoid it, no matter how thirsty they are. When Askeladen saw that the giant was dead he let out a whoop of triumph, and the wolf danced a doggie dance of joy. Soon songbirds came, each one singing “The giant is dead! We all will be fed! All hail Askeladen, Giant Slayer of men!” Soon the whole forest began rang out with the happy calls of animals that had lived in fear of the giant’s wrath. Askeladen didn’t celebrate too long before saying “Come wolf! We must ride to the castle and see if my brothers are still turned to stone!” So he hopped on the wolf and they were away in a flash, running like the wind through the forest. Before long they emerged from the trees in front of the giant’s mountain. There they found a joyous sight, for in the road his brothers and their loves were dancing and singing, celebrating their freedom. The giant’s spell was broken, never to return again. And there, coming down the mountainside, was the princess herself, a wide smile on her face. Askeladen ran to meet her and they embraced. She was free. So the tale comes to a close. Askeladen returned as a hero to his father with his brothers following behind. There was a great celebration throughout the kingdom, and the king was so pleased that all his sons had returned home that he wept with joy. Askeladen was given the title Giant Slayer and was hailed as the bravest and most resourceful prince in all of Norway. He and the princess were soon wed; and when his father died (of old age and happiness, many years later) Askeladen became king after him. The people say that he was as just, wise, and brave a ruler as had ever lived. As for the wolf, he stayed at the castle and was given the title Royal Wolf and Steed, and never went hungry again to the end of his days. And that is the end of the story of Askeladen and the giant who had no heart. I hope you all enjoyed the tale. I have several tales I’d like to write next. This coming friday I’ll post the names of two or three I’m intrested in and put it up to a vote. I had the pleasure of watching The Dark Knight Rises on Monday, and I thought I might try my hand at reviewing it here on the blog. As you know I started this blog in order to become a better writer, and I think writing a movie review would be a good experience. A friend of mine once had the idea that we should start reviewing movies together, and though that never went anywhere we did have a couple of cool ideas on how we would do it. One that I’ll be utilizing here is a dual rating system: I’ll be rating the movies between one and ten based on Artistry and Entertainment. Artistry judges how well the movie is put together, whether it tries anything new and interesting, what emotions it inspires, and just how it holds up to examination as a unique work of art. Entertainment judges how much fun the movie is to watch, how exciting it is, how funny it is, and whether you feel satisfied with the experience as a whole. Those two measures will be in agreement less often than you might think. I think Schindler’s List is an incredible achievement of artistry, a masterpiece of cinema that touches on deep and important subjects; but if I just want a flick to watch on a Saturday night I’m probably going to pick something more like Pirates of the Caribbean. With that in mind at the end of the review I’ll score the movie in each category. Also, because I’m a nice guy, I’m going to avoid spoilers as much as I can. The Dark Knight Rises is the final Batman movie that Christopher Nolan will be involved with. If there is another Batman movie in the future (and there probably will be; he is Batman, after all) it will almost certainly be a reboot of the series with a new Batman, a new Gotham, and a new take on the Batman mythos. Because of this Nolan has had a lot of freedom to end this movie however he wants to. He doesn’t have to leave room for a sequel, and this is his only opportunity to tie up any loose ends in the trilogy. It also gives him the unique opportunity to finish a superhero’s character arc. In comics (and in most superhero movie franchises) the writers cannot actually end the principal character’s story. If Peter Parker decides to quit being Spiderman then you can rest assured that he’ll change his mind within the week and go back to web slinging. If Superman dies (and he did, back in the nineties) then you know that they’ll find a way to bring him back to life. The reason for this is that comics (and movie franchises) rely on a continuous story and the longer that story runs the more valuable the characters become. Marvel is never going to say “Alright, that’s it, no more Spiderman, his story is finished” because that would be financially unsound; Spiderman is worth a lot of money and it doesn’t make sense for a comic book company to stop making comics about its most popular characters. This means that Nolan has a very unique opportunity here; he gets to tell us how the story of Batman ends. This movie promises us closure. I don’t think it is revealing too much to let you know that we get it. One way or another, Bruce Wayne’s story will end by the time the credits roll. The fact that Rises is the last in the Nolan trilogy has caused many speculators on the internet to theorize that Batman is going to die. These rumors are helped by the fact that the movie’s principal villain is Bane. If you’ve never heard of Bane before that’s alright; he’s a pretty unimportant Batman villain, all things considered. Bane is really only famous for doing one thing in the comics; breaking Batman’s back. Batman almost dies because of it. So why would Nolan choose a b-list batman villain for his final film instead of someone more iconic like the Penguin, the Riddler, Poison Ivy, etc.? For a lot of people the answer is obvious: Bane is there because he’s going to break Batman’s back, and considering that it’s the last movie in the series it seems all the more likely that he’s going to kill him this time around. I’m not going to reveal whether any of those rumors are correct, or what actually happens in the film. I just think it’s important information to have before watching it. I believe I’m justified in saying so because the entire movie appears to be built around this question: “Is Batman going to die?” I wouldn’t find it hard to believe that Nolan intended for those rumors to spread because the effect on the movie as a whole is an excellent one. The fact that there is a very real possibility of Batman dying this time makes everything seem more exiting and suspenseful. We all knew that they wouldn’t dare kill Batman in Batman Begins or The Dark Knight; The fact that there are no guarantees this time around adds weight to the entire film. Whether Bane was chosen just to cause this kind of audience reaction is something only Nolan knows. What I do know that many people, myself included, were disappointed to hear that Bain would be the main baddie. When the first trailers came out and I saw Bane stomping around in a parka with a very proper (almost British) accent I wasn’t sure what to think. The entire effect was a little silly. So if you were also worried about Bane as a villain let me reassure you: he works. He works very well. I have no idea how he stacks up with the comic book version of Bane, but this Bane is a villain that is enjoyable to watch and interesting to follow. He’s mysterious, charismatic, and frightening in power. He’s not the kind of villain who walks around pacing while yelling at minions, or the kind who’s (delightfully) over the top like the Joker. Instead he is the picture of a reserved, patient, and inspiring leader. You can tell a lot about a villain by the company he keeps; Ra’s al ghul‘s League of Shadows was made of disciplined and ruthless ninjas, reflecting his own disciplined, honorable, and unyielding personality. The Joker’s thugs consisted of nutjobs, psychopaths, and anarchists because his own fractured and eclectic personality attracted them like moths. Bane’s goons are simple men in rough and practical clothing with submachine guns and beard stubble, yet they act with a strange sense of pride, respect, and complete self-sacrifice to the cause. This reflects Bane himself, whose calm, patience, and total devotion to his mission belie his muscle-bound and thuggish appearance. This review is too long already, so I’ll get down to the nitty gritty: The Dark Knight Rises is a great movie. It delivers on the promise of closure for Bruce Wayne, it has an excellent villain, and the plot (though arguably containing a little too many twists and turns) works well. When I left the theatre I was thoroughly satisfied. Nolan has created an excellent finale to his trilogy, and I have no real complaints. It’s not a perfect movie, but no movie is. On the Artistic level I’d have to give the movie 7 out of 10. It finished Bruce Wayne’s character arc well, it’s well written, and the visuals are stunning. It’s not an artistic masterpiece, but for a blockbuster it’s far above par. On the Entertainment level I’d have to give it 9 out of 10. The fights are exciting, the special effect excellent, there are never any boring moments, and the conclusion is satisfying. My only complaint is that the move does go a little long, so it won’t be a movie that will be easy to just casually watch when you have a couple hours free. So that’s my take on The Dark Knight Rises. If you liked the first two movies at all, then this is one you cannot miss. There is something wrong with the way we worship. Specifically I mean there’s something wrong with the most shallow, superficial definition of “worship” in the Christian sense; worship service. I’ve heard a lot of sermons about how giving is worship, doing God’s will is worship, etc., etc., and this isn’t another one of those. I’m just talking about music and singing. Quite frankly, I think we’re doing it wrong. Now I have to let you know up front, this is all conjecture and theorizing on my part. I don’t have any musical training, I’m not a music minister, and I haven’t taken a music class since the sixth grade. Pretty much all of my evidence is anecdotal. But I think even anecdotal evidence has its place; in any case it might make interesting reading. Let’s back up and get a little historical perspective (again, all anecdotal, I haven’t actually done any research). It seems to me that in the 80s and 90s there was a slow but steady movement in the churches away from hymns and toward more popular music. The general idea (and a fairly correct one, I think) was that if the church was going to be relevant to modern youth it needed to worship with music that youth would actually like to hear. In the mid to late 90s I was a little kid going to a small church in Graham, Washington. During our worship services we had some hymns, some old church songs (like The Trees of the Field, As a Deer Pants for the Water, etc.) and a smattering of more modern songs. As a church we were having struggles. If I remember correctly we didn’t always have a full worship band, and I couldn’t tell you if we had an electric guitar, a bass, or a drum set (something no modern worship service is complete without). Maybe we did, maybe we didn’t. All I remember instrument wise was that our pastor would play the acoustic guitar and someone (possibly his wife?) played the piano. Neither of them were professionally trained music ministers; just people who knew how to play an instrument. Technologically we were far behind modern worship services. For a very long time we didn’t even have a regular projector for the lyrics; just an old fashioned slide projector, and I don’t remember our sound system being very loud. Yet despite all that, I can’t remember a period of my life where I was so in to worship. I loved those worship services. I loved hearing my voice mix with the voices of everyone else in the church. I loved it when someone would start clapping during a song (not clapping like applause, but a slow, regular, rhythmic clap to add rhythm the music. If you’ve gone to an old fashioned church you’ve probably heard this, and if you go to a modern church you’ve probably seen a music minister desperately try to get people to start clapping like this, with minimal success). The claps fascinated me; how could so many different people all sync up their claps perfectly? I became acquainted with the rhythm of the human body, the tones of the human voice, and feeling of closeness and community that comes from singing in harmony with a crowd of others. My favorite songs were the ones that had different parts for men and women. I can think of no better introduction to concept of masculinity or femininity than taking part in one of those songs. I loved to hear the women sing with their high and melodious voices, like birds flitting through the trees. Meanwhile I joined my little voice with the strong, deep, and sonorous voices of the men, like mighty stags running along a mountainside. And then the men and women would come back together and the two sounds would blend like sweet honey to the ears. It was beautiful. Contrast that with a modern worship service. When worship starts at my current church everyone knows it, because of our impressive sound system that fills the entire room with the sounds of electric guitar, bass, and drums. When the singing starts the entire effect is so loud that you can only with great effort hear your neighbors singing. Not that they’re singing very loud; they, like you, are probably singing softy, at a conversational level. You’re all a lot like the extra singers on stage, who are usually women who volunteered to help with worship. You can’t hear their voices either, even though they have microphones. Their voice is drowned out by the worship leader, who is usually a trained musician with a ministry degree. I’ve worked in a sound booth a few times during worship services and they actually do turn down the backup singers so they can hardly be heard. I suppose if they were as loud as worship leader they might sing out of tune and ruin the performance. And performance is an accurate word; the music is so loud, the guitar riffs so sweet, and the singer so on note that the total effect is of a very mild Christian rock concert. We’re there to listen and sing along if we feel like it. Sometimes the worship leader will try to get a clap going on. “Come on, clap everybody!” while he hits the side of his microphone with a quiet thud. Always a few people start clapping, and then slowly stop. Why? Because the clapping seems so quiet and superfluous. We have a drummer taking care of the rhythm, we don’t need clapping. You can hardly hear it over the music anyway. At other times the worship leader might step away from the mic for a bit, to hear the crowd sing. Usually at these points you still can’t hear anyone singing; and if you can it’s a pitiful mewling sound, barely audible over the guitar and drums. Last summer I attended a church service at a Christian camp. It was a work camp, and nobody had brought any instruments along. They dragged out an old overhead projector and put up the lyrics to some old songs. My dad led worship, and though he’s a fine singer he’s certainly not a professional. In fact he was a little off tune for several of the songs. But the effect was incredible. We all saw that if there was any singing to be done we were going to have to do it; if we left it to my dad it would be a pretty poor performance indeed! So we all sang a cappella, and it certainly wasn’t as good a performance as your average worship team can dish out. It wasn’t perfect, but it was worship. It was about you, me, and everyone else singing about how much we love Jesus. I don’t get that at church much these days. I get a great performance; but if I wanted a performance I’d go to a concert. What I need is worship. NOTE: I mentioned in my last post that this would be the conclusion of our story. Unfortunately I vastly underestemated the amount of story there was left. To clarify: this is my longest post in the series, and I still haven’t gotten to the end. However I can say that next Friday will be the conclusion for certian! The Wolf took Askeladen into one of the mountain’s craggy valleys, and they did not travel far before they came to the door of the giant’s castle. The castle itself was not built of stone bricks and mortar like most castles made by man, but instead was solid stone carved out of the face of the mountain. It was hard to tell where the castle ended and the mountain began, and it was not surprising that Askeladen’s brothers had failed to see it from the road. The most obvious sign of it was the door, which was a slab of solid rock carved words in Old Giantish, which nobody can read today and few could understand even then. Leading up to the doorway were five massive stone steps, so large that the wolf had to get a running start to leap over each one. It was there that the wolf left Askeladen. “Here you are, here you are! The princess is inside. I will go hide in the woods now; but if you need me just whistle three times and I’ll be here as quick as the wind!” Before Askeladen could protest the wolf had leaped down the stairs and ran out of sight, moving at incredible speed. Askeladen found himself alone, and unsure. “Well this is a fine spot I’m in;” he said to himself. 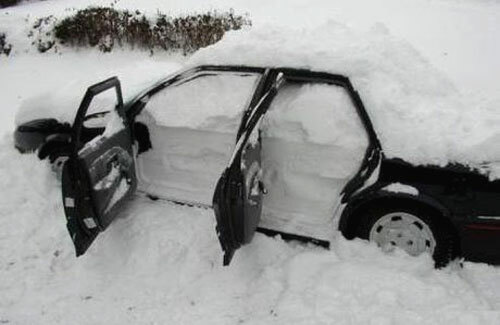 “I suppose there’s nothing for it but go inside. Still, I hope the wolf was right about the giant not being at home. But how will I get his great door open anyway?” It was a good question, for the door was far too large and heavy for Askeladen to ever hope to move by himself. All was not lost though, for when Askeladen looked closer he saw that the door was open a little, and though the opening would only have been only a small crack for a giant it was more than wide enough for Askeladen to squeeze through. Still, Askeladen hesitated; though he was determined to save his brothers, I must say that he was very afraid (as any wise man would be before entering a giant’s home). Still he knew that he couldn’t stay on the doorstop forever. “Better to be caught and eaten in the castle while trying to rescue my brothers than caught and eaten on the doorstep shivering like a coward.” He said to himself, and with that in mind he entered the castle. Beyond the door was a short front hall; short to a giant that is, but to Askeladen it was long indeed and the ceiling was many times higher than his own head. The floor was bare and the light dim, and Askeladen made his way through it as quietly as possible. At the far end was an open doorway, and beyond it glowed flickering orange firelight. Askeladen peeked his head into the doorway, and saw a large chamber beyond. It was a circular room, and sunken into the far wall was a large hearth with several great logs burning away, filling the room with warmth and light. In the center of the room stood a round wooden table, and a bed sat along the wall. There were several great wooden chests, and a wooden dresser that was likely filled with giantish clothes. All of it, of course, was giant sized. Way up high, on top of the wooden table, stood the princess. She was busy setting out the table for dinner, dragging a plate that was almost as big as she was next to a trident sized fork. She was so busy that she didn’t notice Askeladen peeking in, and Askeladen found her so beautiful that he could say nothing for a quite some time. Her hair was long and brown and slightly curly, and though she was wearing a dirty patchwork dress she was still a vision of loveliness to Askeladen’s eyes. He determined then and there that he would do anything to rescue her. He stepped out into the room then, and when the princess saw him she gasped, and dropped the plate, she was so surprised. “Good heavens!” she said. “Who are you, and what’s brought you out here to this horrible place? Don’t you know that this is a giant’s castle? !” So Askeladen climbed up the table leg and sat and told her all about his long journey, his brothers fate, and how he must slay the giant and save them or his father would die of grief. “Well,” she said, “that’s very touching, and you must be brave. But it’s sure to be the death of you! No one can slay the giant, because he doesn’t have any heart. He used a spell to rip it out long ago, and now he’s as immortal as the mountains.” She looked at him with great concern and a little fear in her eyes, for she found him very handsome, if a bit foolish, and didn’t want him to be eaten or turned to stone. Her heart softened at that. Though she hardly knew it she was beginning to fall in love with him as well. “Well, since you won’t go home, we’ll just have to try the best we can. Now listen! The giant will be home soon; hide under the bed and stay as quiet as can be. Listen well to what he says when I speak with him; I think I may have a plan.” So Askeladen hid himself under the giant’s bed, trying very hard not to sneeze from all the dust. The princess went back to setting the table, and she had just put out the giant’s food when Askeladen heard the great stone door creak open and then slam shut with a thunderous crack. The giant was home, and with footsteps like falling logs he came into the room. The giant threw himself down in a huge wooden chair at the table, and stretched his arms out with a great yawn. “Aaaaaagh! What a day I have had, going to and fro, eating my fill of all living things and turning the rest to stone.” Suddenly he sniffed the air, and wrinkled his nose. “Ugh!” he shouted in a roar that almost made Askeladen to jump in fear, though he remembered himself and stayed still. “Where’s that terrible smell of man’s blood coming from? !” continued the giant. The giant was silent for almost a full minute, and Askeladen was afraid that he was about to get up and turn her to stone for asking such a question. But soon the giant yawned and said “Oh, that’s not something you need worry yourself about. If you must know, I keep it right under the front step. Now stop your silly questions and let me sleep.” Soon the giant was snoring away with a sound like a storm, but Askeladen was pleased. We’ll just see if we can’t find his heart, he thought to himself, and slowly went to sleep. When morning came the giant awoke, dressed, and then went on his way to wander the woods. When he had been gone for some time Askeladen came out from his hiding spot, and he and the princess went out the front door and started searching for the heart. The slab that made the front step was far too large for them to move, but Askeladen found that by doing a little digging he could work his way underneath it from the sides. He and the princess dug and searched all day long, but they couldn’t find any trace of the giant’s heart. When they saw that the sun was getting low they filled in their holes and Askeladen went inside and hid. The princess however went out and picked the prettiest wildflowers she could find, and then strew them about the entire front step. Then she went in and prepared the giant’s supper. The next day after the giant had left Askeladen and the princess opened up the great wooden chest and began to search it. The chest was full of odd things; giant wooden toys, statues, strange rocks, bits of fur, and a rusty iron clock that appeared to be broken. But when they’d searched it from top to bottom they still hadn’t found the giant’s heart. “I was afraid of that,” said the princess, “especially after he fooled us yesterday.” So while Askeladen put everything back where it was, she went out and picked more flowers, and began to twist many of them into beautiful garlands. Then she strew the flowers and garlands on the chest, and they waited for the giant to return. Before Askeladen left the princess hugged him tightly, and said “Be careful! If the giant finds you searching for his heart he’s sure to eat you up or turn you to stone!” Askeladen patted her on the back, kissed her forehead, and told her that he would stay safe and sound. Then he stood on the front step and whistled three times. As quick as the wind the wolf leaped up the steps, and Askeladen rode him into the woods, in search of the giant’s heart. Will Askeladen find the heart? And even if he does, can he escape the giant’s wrath? Come back next week for the thrilling conclusion! Hey guys. I’m glad everyone seemed to enjoy Monday’s post. It was fun to write and apparently funny to read. It’s my most viewed post so far, and I would have liked to follow it up with something else that was lighthearted and funny. Unfortunately life has gotten in the way. I wrote Monday’s post on Saturday night, which turned out to be a good decision on my part. I normally would have written it on Sunday but I knew I would be busy. You see my grandpa was in the hospital, and I was going to go visit him. Recently he’s been having trouble sleeping, and kept fainting from exhaustion during the day. That was a bit worrisome, but that’s all. Nothing to get worked up about. But then he collapsed in the hallway and banged the back of his head on a door hinge. They had to take him in to get stitches. They did a CAT scan and found that there was some bleeding in the brain, and it was forming a large blood clot underneath his skull. Apparently this isn’t hard to fix…if you’re in your twenties or thirties. But my grandpa is 88 years old. In order to take care of it they would have to open up his skull, and because of his age there was a serious chance of him dying on the table. Our whole family was worried. We all started praying fervently for grandpa to make it through surgery okay. When he got through surgery without dying we were all relieved. That’s when my brother and I decided to head up with my dad to see him on Sunday. On the way there we got a call. The bleeding hadn’t stopped. The blood clot was reforming. There was nothing more we could do. Now it’s just a matter of waiting for the clot to kill him. So I’m afraid I can’t really write anything lighthearted right now. I can’t seem to write much of anything. They’ve brought grandpa home now. He’s going to spend his last days there, where he’s more comfortable. Away from the needles and the tests and the strange rooms. When I saw him last his was still unconscious, drugged out of his mind on painkillers. I don’t know if he’s going to ever fully wake up. I spent a lot of time trying to prepare myself for this, growing up. I knew that someday he would die. But it was so sudden…he was so healthy. You don’t expect to wake up one day and find that someone you love is about to die. I’m glad that the last time I got to be with him was good. My little brother David and I were listening to him tell us stories about his time serving in WWII. We listened and asked questions for over an hour. I didn’t know that would be the last time I would get to talk to him. Sorry to dump all these sad thoughts on you. But I think they’re important. If your grandpa is still alive, if anyone you love deeply is still alive, be sure to let them know how much they mean to you. Tell them how proud you are of them, how much you love them. Life is too short for shallow hugs and polite goodbyes. And people are too fragile. Friday will be the conclusion of “The Giant Who Had No Heart”. Next week should be random posts like usual. I’ve never mentioned it on the blog but I do, in fact, have a job. This summer I am happily employed at Mt. Rainier National Park. During my working hours I am a park ranger, from the bottom of my official dress hiking boots to the tippy top of my regulation summer wear straw hat. Specifically I’m the kind of ranger who sits in a booth all day and takes your money when you arrive. See that tiny little booth, waaaay back there? That’s where I spend my days. It’s a good job, and I’m very happy to have it. I get to work in one of the most beautiful places on earth, I get paid an excellent wage for someone who’s still working on his bachelor’s degree, and the work isn’t too strenuous. Really the job has only one downside: I have to deal with people all day. It’s not that I hate people. The vast majority of visitors to the park are nice, decent, hardworking folks who just want to relax and spend some time in Mt. Rainier’s serene and majestic beauty. I don’t even mind when the rare visitor shows up who’s a jerk; they just remind me how good everyone else is. There is one thing that drives me up the wall though. You know how they say there are no such things as stupid questions? Maybe so. But there are definitely such things as annoying, frustrating, and ridiculous questions. So for your reading pleasure I’ve compiled a list of five questions I get asked on a regular (usually daily) basis that make me want to eat my own straw hat in exasperation. Why it drives me crazy: “Can we have a map?” sounds like a very reasonable question, and really it is. But here’s what you have to know: everyone who enters the park gets a map. As soon as you hand me your money, I’m already grabbing you a map. I’m going to hand it to you in about three seconds. You can probably see me holding the map in my hands as you ask the question. It’s not a stupid question, but boy is it frustrating to have someone ask you to give you something that you’re already in the process of getting for them. The question would be tolerable if it weren’t for the fact that I’m asked it over, and over, and over, and over again throughout the entire day. I should set up a sign: FREE MAPS TO PEOPLE WHO DON’T ASK ME ABOUT MAPS. This is our best guess though, maybe you’ll find it helpful. NUMBER FOUR: What’s the weather like up top? Why it drives me crazy: How the heck am I supposed to know? Do they think that I have a live camera feed of the weather up there pumped into my booth? All I can tell you is what the weather is like here. And hey, guess what? Is it sunny here? Then it’s probably sunny up there. Cloudy? Chances are good it’s cloudy up there too. It’s a half hour’s drive away, not in another time zone. You probably wont need your coat. NUMBER THREE: How much farther until we get to the top of the mountain? Why it drives me crazy: Mt. Rainier is 14,409 feet tall. That’s almost three miles, straight up. When it’s about 75 degrees down here, it’s usually 22 degrees at the summit. Between the entrance and the peak are miles of thick forest, dozens of glaciers, and treacherous, unstable precipices. Every year around 6,000 or more hikers attempt to climb the mountain; only half actually make it to the top. It’s a harrowing two day journey through freezing winds, over ice crevasses hundreds of feet deep, and across cliffs of crumbling volcanic rock. I’M SURE YOU’LL MAKE IT JUST FINE IN YOUR RENTED MAZDA, SIR. To be clear: there are no roads to the top of the mountain. The concept is ridiculous. 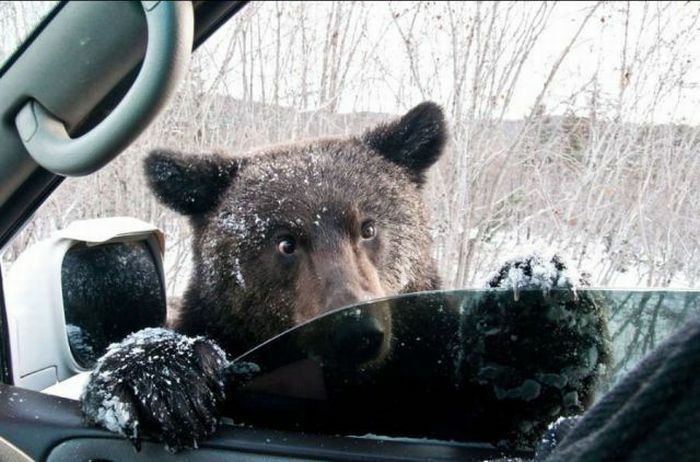 Remember, don’t leave your windows open or the glaciers could smell your food, and break in. NUMBER TWO: Where do you keep the animals at? Why it drives me crazy: Seriously? 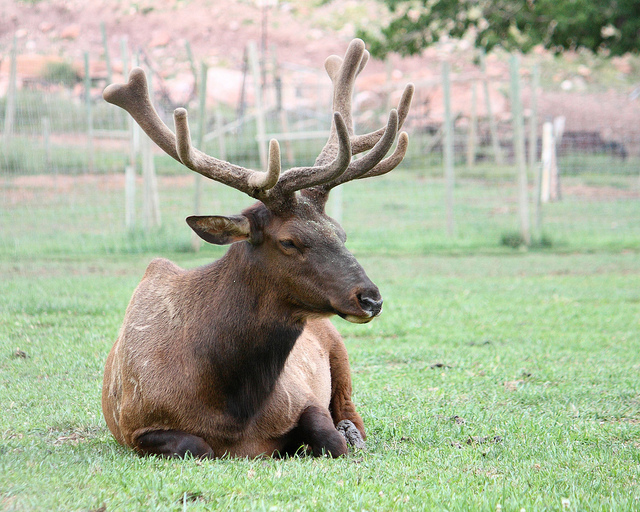 This is a National Park, not a zoo. The animals are wild. They go where they want, when they want. We don’t keep them locked up for people to gawk at. Imagine if I went to your house and asked you where you kept the squirrels. Feeding the bears is prohibited, so don’t let him eat you. NUMBER ONE: So what is there to do in here anyway? Why it drives me crazy: ….Why? Why did you come here if you didn’t have any clue what you were going to do when you arrived? Did you just randomly say “Hey, Mt. Rainier is a thing, let’s hop in the car and go” when you woke up this morning? It’s a two hour drive from most places: did you never stop to think about what you’d do when you got there? And what kind of question is that anyway? It’s a National Park; you know….nature! Trees! Squirrels! Waterfalls and mountains and scenic vistas! Mt. 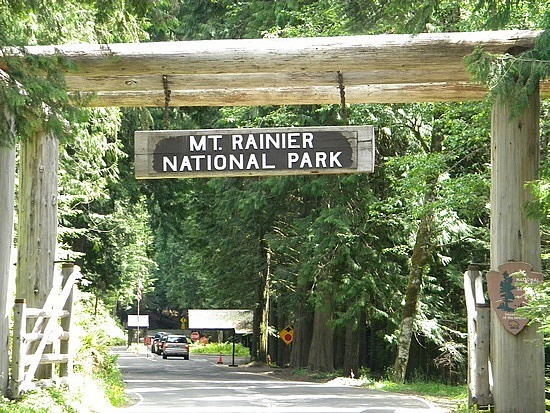 Rainier National Park is a gigantic place, with over seventy hiking trails, dozens of waterfalls, four visitor centers, two historic lodges, and a GIANT FREAKING MOUNTAIN IN THE MIDDLE. That’s what there is to do! It’s not Disneyland for crying out loud, we don’t have a roller coaster or anything. Whew. It felt good to get that off my chest. If I get any particularly stupefying questions I’ll be sure to post them here for your amazement. Also, what, if anything, is the most frustrating question you’ve ever been asked at your job? Post in the comments. Here is Part 2 of The Giant Who Had No Heart. If you haven’t read Part 1 then you should do so now, or you’ll likely be a little confused. If you’re wondering what the heck Storytime Friday even is, then this is the post you’re looking for. Askeladen traveled for many days in search of his brothers. Whenever he saw a farmhouse or a town he stopped and asked if they’d seen the six princes; but nobody had seen them since they had left on their quest months ago. Still Askeladen did not despair, but continued on his way. One day, as he was trying to encourage his old and tired horse to pick up the pace, he ran across a raven lying in the road and flapping its wings. The raven was so thin and weak from hunger that it could not even lift itself an inch. As Askeladen approached the raven tilted its tired head and said “Please stop, dear friend. Give me something to eat, and I will surely help you when you need it most.” Askeladen was not afraid (for the woods were full of mysterious things in those days, and it was not too strange to hear a wild animal talk like you or me) but said “I don’t have much food left, I’m afraid, and it doesn’t look like you could be much help to me.” He stopped and thought for a few moments. He only had some hard bread and cheese left in his pack, and it could be days or weeks before he could get more. Still, the bird was in a sad state and Askeladen’s heart grew soft. “Alright raven, here. I’ll give you some food.” He split his loaf of bread in half and gave it to the raven, who thanked him over and over between bites of bread. Askeladen just smiled and continued down the road, hoping he wouldn’t go hungry because of it. Askeladen would have laughed if he wasn’t so hungry. “What kind of help could a salmon give me? And I’m terribly hungry.” Askeladen thought for a moment, before groaning in frustration. “I may be hungry, but how can I refuse to help now that you’ve asked me? Alright fish, here you go.” And he threw the salmon back into the rushing stream. The salmon thanked him over and over before swimming downstream, but all Askeladen could do was worry about where he’d find his next meal. So Askeladen mounted the wolf again, and headed to the castle of the giant. Be sure to come back next friday to see what happens to Askeladen when he enters the giant’s castle. Hey everyone. I’m working on a new article to pitch to the same online videogame magazine that kindly rejected my last attempt. I thought I’d put my rough draft here, so you have some content to read and I can get some feedback (maybe: nobody really comments on my writing pieces. Still, I can dream right?). The sad thing is that if they accept it there’s a good chance I’ll have to remove it from my blog. So: enjoy it while you can. It could disappear. I frowned. I wasn’t nearly high enough to make orbit yet. I flipped off my stabilizers and set my rocket at a 45 degree angle to the horizon line. I ignored my “copilot” and continued at full burn towards the stars. I checked with the tracking station. The blue line that marked my trajectory was slowly forming a circle around the planet. True, it was a little lopsided…well maybe more than a little. Actually it seemed to be growing more and more asymmetrical as I watched. Suddenly the circle became a line, curving off into space. Fortunately for astronauts everywhere I was not actually in charge of a mission to space. I was just playing the latest version of KSP (short for Kerbal Space Program) an indie game project from a company called Squad. The game’s premise is simple: you are in charge of the space program of a race of little green men known as the Kerbals. You design their rockets from scratch and then pilot them on missions into outer space; if everything goes right, that is. You have complete freedom when it comes to creating your rockets, and the game will never stop to tell you if your designs will just blow up on the launching pad. Apparently Kerbals believe in going straight to live astronaut testing, and if you’re first attempts are anything like mine were you’re going to go through dozens of little Kerbalnauts before you get anywhere near a stable orbit. The game had been pointed out to me back when it was in alpha by my “copilot”: better known as my older brother. He’d shown me where to download the game and told me it was a lot of fun. A couple days later a friend and I decided to take the game for a test ride. We spent the next few hours laughing hysterically as our designs each found a new way to explode into tiny pieces within seconds of launch. Some were straightforward; we’d hit the launch button and they’d detonate instantly, engulfing the launch pad in a smoking fireball. Others would make it a few hundred meters into the air before losing structural integrity, rockets and wings ripping off one by one in a slow, almost graceful, disintegration. A few designs would simply fall over before they could even be launched, toppling like an unstable Jenga tower. Our designs became sillier and sillier as we attempted to find an even more ludicrous way for our rockets to self-destruct. But after the third hour had past we decided we’d had enough fun goofing around. It was time to take what we’d learned and build a sensible rocket. Our goal? Orbit. With high hopes we christened the Sanity I, the first of a new series of practical rockets. We lost control of it after about 30 seconds of flight, and it plummeted to the earth in a ball of flame. The Sanity II and III met similar fates, and Sanity IV: A New Hope was the worst one yet, ripping itself to pieces just moments after leaving the launch pad. Instead of getting better each new design was just failing in new, unique, and frustrating way. We spent two hours throwing ideas around trying to find one that would work. Finally we gave up: we checked online to see how to do it properly. There we not only found a design that worked, but discovered all kinds of useful information about rocket construction. We had no idea you could stack fuel tanks, for instance, and that alone made a huge difference. We made it to space on our next try. A couple of launches later and we made it to orbit. My friend and I felt accomplished. It was a moment of triumph when our command capsule safely landed our Kerbalnauts on the far side of the planet; but at the same time we were a little upset that we were reduced to looking online for help. It seemed to cheapen our accomplishment. It’s like using a walkthrough to make your way through an adventure game: sure, you won, but it was the walkthrough that solved all the puzzles for you. You might as well have just given up and stopped playing. I felt the same way about KSP. Sure, we made it to orbit; but it wasn’t by our own skill, but someone else’s. I stopped playing after that, and eventually forgot the game almost entirely. That was almost a year ago and KSP has grown a lot since then. They’ve added two moons to travel to, a tracking system to plot your trajectories, and a ton of new parts. It’s in beta right now and new content is being added all the time. My brother encouraged me to try it out again. I decided to make it my goal to reach the moon. I still haven’t gotten there, and with each failure my brother’s frustration at my refusal to listen to his advice has grown. Every time I sent my Kerbals on a one way ticket to starvation in deep space my brother has told me exactly what I’ve done wrong. Each time I’ve refused to listen to him. After all, if I just do everything he tells me to I’m not really playing, am I? I might as well just look up the answer on the internet again. But as I failed for the 27th time, I realized something. I was thinking about this game completely wrong. This isn’t an adventure game. This isn’t even an FPS, RTS, MMO, or RPG. And I obviously don’t mean in terms of gameplay: by its gameplay alone it’s more like a flight sim than anything else. I just mean by terms of what is and is not cheating. If you look up a walkthrough for an adventure game, then you’ve basically defeated the purpose of playing. The whole point of adventure games is to figure out the correct way to solve a puzzle. It’s like taking a multiple choice test: there is only one right answer. If you look the answer up on a cheat sheet then you didn’t really pass the test; you just copied answers. But with most other genres it’s a little different. Looking up a walkthrough for a quest or a particularly hard boss is less like cheating on a test and more having someone tell you exactly what challenges you’re going to face during football tryouts. Sure, now you know that you know exactly what the couches will be looking for, but if you’re not strong or fast enough the knowledge won’t do you that much good anyway. In the same way knowing the boss’s weak spots is helpful, but if you aren’t skilled enough to hit it then you’re still out of luck. In a RTS you can look up some strategy guides to learn the optimal build order for victory; but in any good RTS no one strategy is undefeatable, and your opponent might do something unexpected that makes the strategy useless. In the same way looking up information about how to win has different levels of acceptableness. In an adventure or puzzle game its unacceptable: anyone can win if they know the answers, so you get no credit. In an FPS or RPG it’s still frowned upon, but understandable if you’re having a really tough time with a certain quest or boss. And in an RTS there is almost no stigma against looking up strategies; in fact it’s considered normal and completely acceptable. I realize now that KSP lands in a forth category, one that I find harder to find a name for. 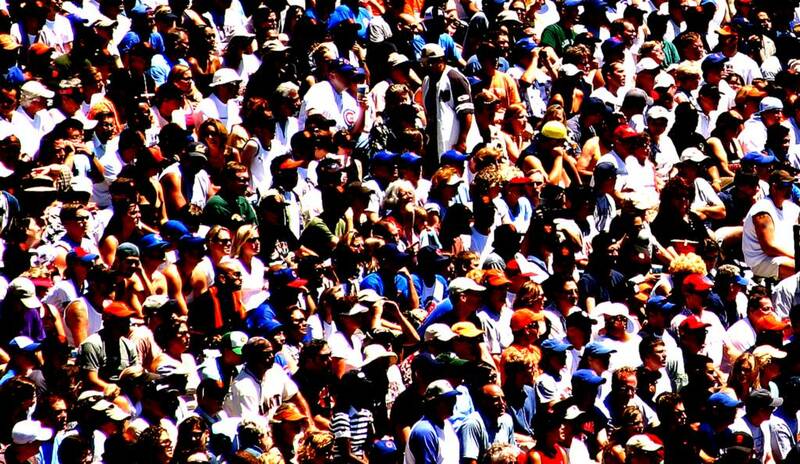 You could call it indie, but not all indie games fit. Probably the best example I can think of is Dwarf Fortress. If you’re not familiar with Dwarf Fortress, it’s a game that can be downloaded for free and has been around since 2006. Dwarf Fortress is notable and unique for a lot of reasons, but right now I’m concerned with one specifically: the fact that if you try to play Dwarf Fortress without anyone’s help you are in for a world of pain, confusion, frustration, and ragequitting. You cannot play Dwarf Fortress without referencing its wiki or consulting the community forums. There’s no tutorial, there’s not real in game guide, and you could go online and memorize every element of the game and still fail miserably 90% of the time. And that’s fine. There are some games where it’s not only acceptable to look up the answers: it’s downright necessary for the enjoyable playing of the game itself. Dwarf Fortress is arguably the king of these games but it’s not the only one. Minecraft is the most recent and most notable entry into this category. I was lucky: the first time I played Minecraft it was at a LAN party with someone in the room who had played it before. Without his guidance I would have had no clue what I was doing; thanks to them my first experience with the game wasn’t walking around wondering what I was supposed to do before getting killed by zombies after the sun set. Instead it was filled with frantic activity and steady learning. “Punch one of the tree blocks to get some wood, and make a craft table. See those boxes above your inventory? That’s how you craft. You can make tools to do different jobs faster, but right now we need to make some picks and find some coal so we can make torches before it gets dark. Yeah, we’ll need those because zombies come out when it’s dark and will kill us, so let’s get moving.” Minecraft is a game where if you’re too proud to ask for help or look it up on the wiki you will not be able to have much fun. Sure it’s possible to figure out all the crafting recipes on your own by trial and error…but it’s not much fun, and you don’t feel any less accomplished if you look them up. KSP is the same way. Sure I had fun experimenting with new designs: but it’s incredibly frustrating when your rockets fail and you don’t know why. Online there’s a whole community of people who are all learning together. It’s not cheating to share in that knowledge. Imagine if you tried playing a game like Shogun: Total War or Starcraft II for the first time and you refused to use the tutorial first. If you got frustrated and confused, then it would be your own fault. But for a lot of indie games like Minecraft or KSP there is no (or only extremely simple) in game tutorials. The community is the tutorial, and if you don’t use it then you won’t be able to enjoy the game to its fullest. So it’s time for me to put down my foolish pride. If you need me I’ll be cruising the KSP forums looking for tips on how to get to the moon. I’ve been doing some interesting reading lately about the Middle Ages. The Middle Ages are particularly interesting to learn about because we already have some pretty strong ideas about what they were like. When you hear “Middle Ages” or “Medieval” your mind immediately is filled with images of castles, knights in shining armor, jesters, grubby peasants, witch burning, and the Catholic Church. If we were asked to explain what the Middle Ages were, we’d probably have to say that they were a period of ignorance and violence between the fall of the Roman Empire and the Renaissance. What we usually fail to realize (and what I was completely ignorant of) was that the people of the Middle Ages had an incredibly complex and developed conceptual model of the universe. We think that if they looked up at the stars at all they just wondered what they were; in reality they knew exactly what they were, where they were, and how all that related to themselves. C. S. Lewis’ book The Discarded Image deals with this model, and it’s a fascinating read. It also helps us shed some light on a historical event that we all “know” very well, but don’t truly understand: the trial of Galileo. We are taught two main facts about Galileo: he discovered that the earth orbits around the sun, and the church forced him to deny his findings and then put him under house arrest until his death. The standard explanation for why the church refused to consider the idea that the Earth orbits the sun is that it would go against their religious principles. Everything must orbit the Earth because the Earth is the most important and central part of all creation. If the Earth revolves around the Sun then we would lose our “place of honor” in the universe. After all, Christianity teaches that God Himself became a man and died for our salvation: therefore Earth must be the center of the universe. The Church didn’t like Galileo proposing otherwise and used its power to shut him up for good. This is a nice, neat little story about how religion and science will always be at odds. It’s also complete codswallop. To understand why, we have to understand what the Medieval conception of the universe was. Let’s start at the most basic building blocks. Medieval scholars believed that (almost) everything material was defined by its position relative to “The Four Contraries” (or Opposites). 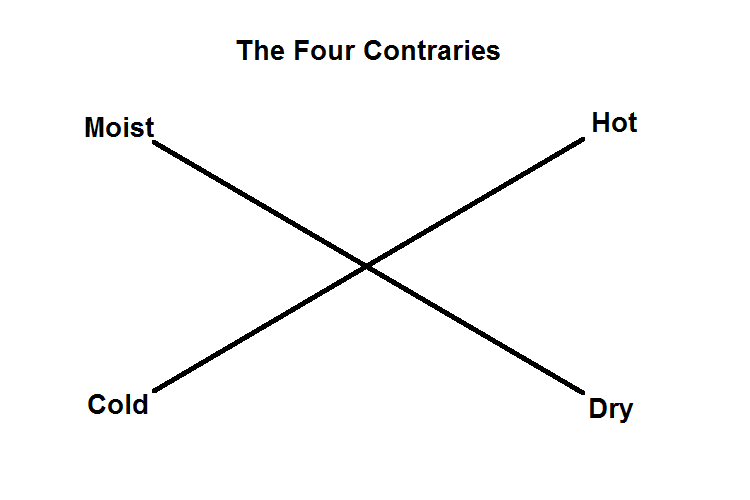 The Four Contraries were Moist, Dry, Hot, and Cold. 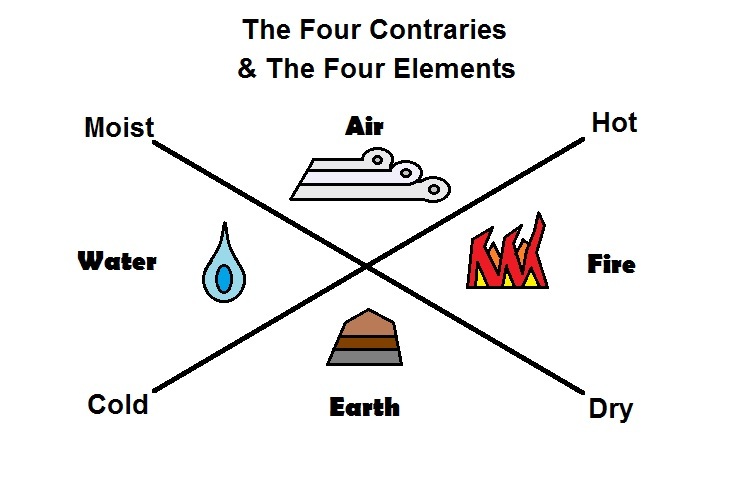 The four elements that made up everything (almost, I’ll get to that later) come from the combination of these four Contraries. Fire is a combination of Dry and Hot, Water of Moist and Cold, and so on. Most of us are familiar with the four “classical” elements, Earth, Wind, Fire, and Water. The people of the Middle Ages believed that everything that existed under the moon was made up of these four elements. I say under the moon because the Medieval model had no conception of space as an empty vacuum. Instead they believed that everything beyond the moon was filled with Aether (also known as Quintessence, one of the coolest sounding words ever). Aether was the purest substance possible. It was completely transparent and made up the “atmosphere” of space. Have you ever (probably in science class) taken a glass beaker and filled it with equal parts water and oil? As you know the oil will form a solid layer on the top, with the water falling below. If you poured in several liquids of different densities into the beaker and waited long enough they would all form individual “pure” layers based on density. Medieval scholars understood this just as well as we did, and they applied it to the universe. 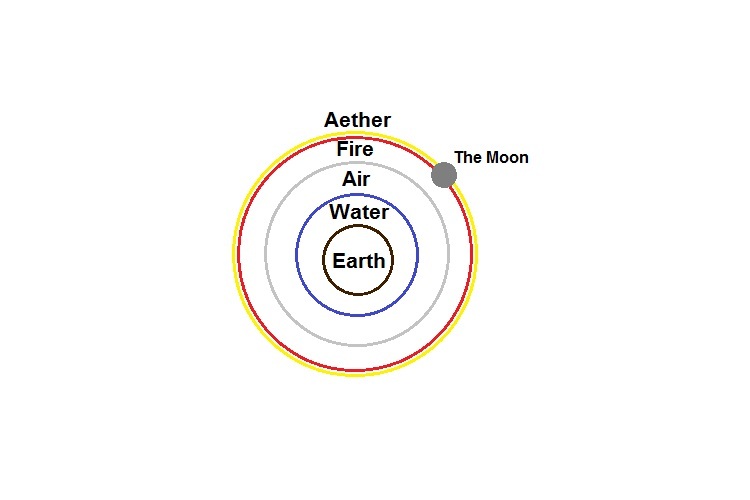 Aether could never mix with the four classical elements because it was “purer” than them. Even if you could somehow stir up air or earth or water past the moon and into the aether it would soon settle back down to earth. The four elements each had their own level of purity. Earth was the least pure, and it formed the “bottom layer” of the universe, so to speak. Next in purity was water, which sits on top of earth in the oceans lakes and rivers. After that comes air, which forms the atmosphere above earth and water. Finally fire makes up the final layer before we reach the aether. This may seem surprising to us, but it made sense from the Medieval point of view. 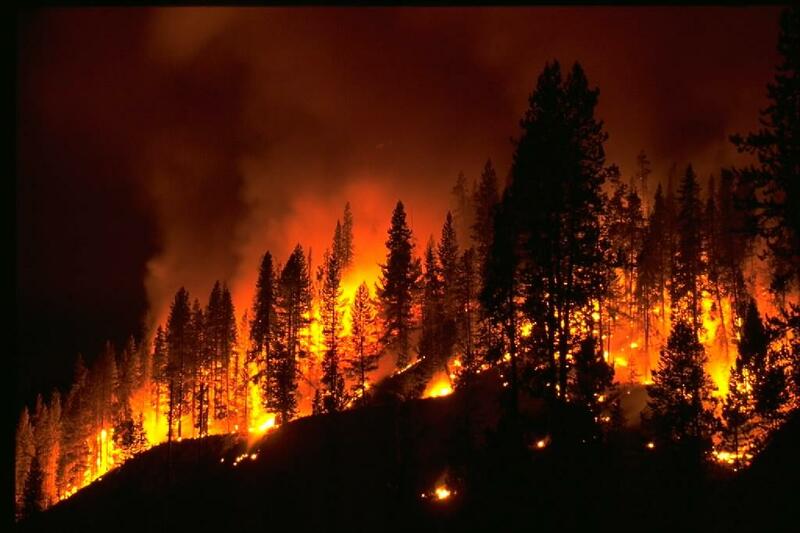 They believed that the fire we see on earth is “impure” fire, full of contaminants like ash and smoke. They conceived that fire in its purest form was completely transparent, nothing but pure heat. If you’ve ever watched the heat distortion come off the top of a fire and “rise” to the sky then you can probably understand why they thought this way. This leads us to one of the most important things to understand about the Medieval Model. 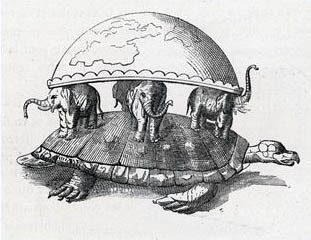 Contrary to popular belief the people of the Middle Ages did not believe that the Earth was flat. It had been well known that the Earth was round ever since the days of the Greeks: they even had a fairly accurate estimate of the Earth’s circumference. They also understood gravity; not mathematically or scientifically (that would wait until Newton), but in principle. They knew that since the Earth is a sphere and gravity pulled all things “down” relative to your position then all things must be pulled toward the center of the Earth. Therefore Earth must be at the center of the universe. After all it wouldn’t make sense for all things to be pulled toward just any random point. Note that the center of the universe is not a much honored position in this case: it would be more accurate to say that Earth is at the bottom of the universe. Earth was literally made up of the impure dredges of the cosmos, the clogged up drain of the universe. This point is made even clearer when we look at Medieval Astronomy. We already know that the five elements form five layers around the Earth from most impure to most pure: earth, water, air, fire, and aether, like so. 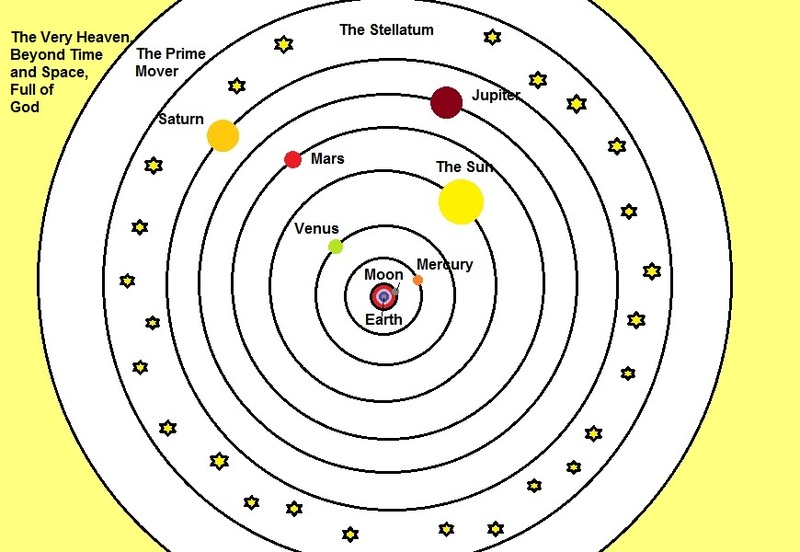 The Moon’s orbit acts as a boundary between Earth and the rest of the universe. Under the moon is all that is impure: beyond it is nothing but purest aether; literally Heaven. The model continues from there. Each planet (and the sun) also orbits around the Earth of course, and each one forms another boundary into a higher level of Heaven. The Stellatum is the second to last layer, and it contains all the “fixed” (unmoving) stars, forming the backdrop of space. The final layer is the Prime Mover, which is the sphere that causes all the other spheres to rotate. The Prime Mover is the edge of the universe. Beyond it is nothing but God, eternal and limitless. Notice, again, that Earth is the farthest location in the universe from God’s “home”. We’re far closer to Hell, which they believed was encased at the center of the Earth. So let’s summarize: Earth is the bottom of all creation, millions of miles from God, insignificantly tiny compared to the rest of the universe, and made up of a collection of the impure dredges of all existence with Hell itself at its center. This is our “place of honor” in the universe, and it’s what most people misunderstand about the impact of Galileo’s theory. Galileo didn’t make the Earth too unimportant: he gave it back its importance. Today we may think of the Earth as many things: small, insignificant, fragile. But we no longer consider it the garbage heap of the universe. We no longer consider it the lowest place in all creation. Compared to the dead worlds we’ve discovered so far Earth is something very special and precious indeed. So why did the Church reject his theory outright, forcing him to deny its truth? That is a case that could take up a whole book itself, and this post is long enough already. The only point I wanted to make is this: Galileo’s ideas were not rejected because they made man too small. If anything, they made man far too large. Posted in Christianity, History, Science!